Three senior citizens with a love for flowers and a tendency to stumble into murder, the (LOL)4 are Little Old Ladies, Laughing Out Loud, Living Our Lives with Lots of Love. 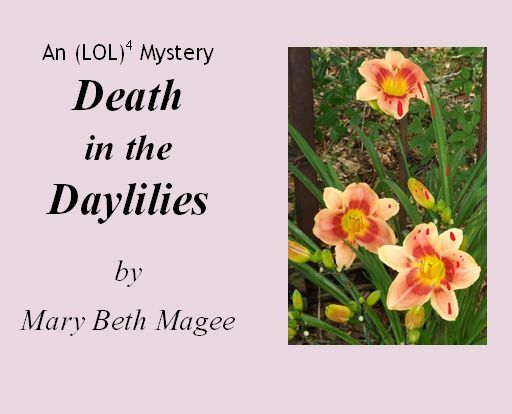 Sisters Hope Appleton and Mercy McKay, and their friend Susannah Bowles find Death in the Daylilies. Can they find the killer before they end up LOLD--Little Old Ladies Dead? Meet (LOL)4, the ladies of Cypress Point--three not-so-spring chickens who have an interesting habit of finding themselves in the middle of murder. They consider themselves to be Little Old Ladies, Laughing Out Loud, Living Our Lives with Lots of Love: (LOL)4. Hope Appleton has filled the hours since her husband died with gardening and spending time with her widowed friend Susannah. Can the arrival of her sister, Mercy McKay, help her back into life? Susannah Bowles lost her own husband several years ago. She knows what Hope is going through and is willing to walk through it with her. The seasons in their gardens are metaphors for the seasons of life they are experiencing. Mercy McKay has returned to Cypress Point after four decades of living in the Midwest. She's still hurting from her ex-husband's infidelities. She wants to comfort her sister and supplement her retirement through the sale of her crochet projects. Three women who get through life with faith and love. Share their adventures through the (LOL)4 Mysteries, part of The Cypress Point Chronicles. Death in the Daylilies is now available as an eBook at Amazon, iTunes, Barnes & Noble and Smashwords, in print from CreateSpace, B&N and Amazon, and through Audible as an audio book. The sequel, Ambush at the Arboretum, can be purchased through Amazon, iTunes, Barnes & Noble and CreateSpace. The audio book will be available soon. Want to join the Cypress Point Street Team? Get the details and access the signup form here. Membership is free and so is the fun!